Curry College, a private four-year Liberal Arts College with the main campus located in Milton, and a satellite campus located in Plymouth. Bridgewater State University, a public four-year Liberal Arts College located in Bridgewater. It is the largest public university in the Massachusetts State University system outside of the University of Massachusetts system. Stonehill College, a private four-year Roman Catholic, Liberal Arts College located in Easton. 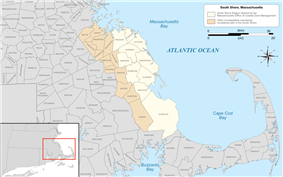 ^ "Massachusetts rules list of Irish towns". ePodunk. Retrieved 12 January 2011. ^ Sweeney, Emily. "How the South Shore became the Irish Riviera". The Boston Globe. Retrieved 12 January 2011. ^ "The Coastal Zone". Massachusetts Office of Coastal Zone Management. Retrieved 2009-09-05. ^ "CZM's Regional Offices". Massachusetts Office of Coastal Zone Management. Retrieved 2009-09-05. ^ "MAPC - Inner Core Committee:". Metropolitan Area Planning Council. Retrieved 2009-05-17. ^ "MAPC - South Shore Coalition". Metropolitan Area Planning Council. Retrieved 2009-05-17.